Keystone Human Services, a large behavioral health organization based in Lancaster, Pennsylvania, was facing replacement of two existing electronic health record systems. One system was no longer supported and the vendor that developed the application went out of business. The other system did not meet the provider organization’s billing needs. Keystone owns and operates 370 homes throughout Pennsylvania, Delaware, New Jersey and Connecticut. Each home houses one to 16 individuals with intellectual disabilities, mental health issues or autism. These individuals need to have their care, both medical and individual support plan related, documented, tracked and reported upon both internally and to the state and federal government. An EHR is necessary to track family history, medications, support plans, goals, outcomes, compliance issues, and communication to family members, the government and medical providers. CaraSolva for medication administration offers a simple user interface, which resulted in less training time, Jabour noted. It also alerts staff and supervisors when a medication is due and when it is past due. Keystone now is constructing interfaces to its pharmacies to avoid data entry issues. “We are in the process of implementing CareLogic for all other EHR needs, other than electronic medication administration record,” he said. Keystone has three service lines (intellectual disabilities, autism and mental health) that all have differing needs due to regulations. In some regards, this is a more difficult implementation than doing one at a hospital, Jabour said. The organization has a user base that is mainly paper-based and dealing with individuals that in some cases have difficulty communicating. Also, the point of care can be in the home, at a day program, at work, at a healthcare facility or really anyplace in the community. Keystone has allowed different regions to develop their own versions of care documents so it is difficult to get everyone to agree on standards. The organization is making changes to improve service so this is much more than an EHR implementation, it is really a transformation of how the organization supports individuals, Jabour said. Implementing a new EHR is forcing Keystone to look at all of its policies and procedures and to improve, he added. 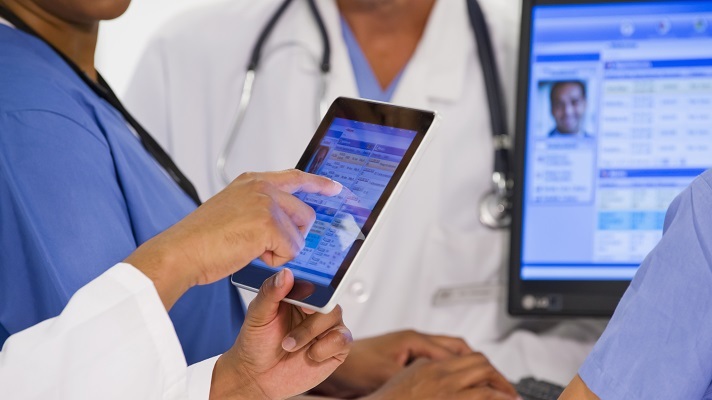 Keystone is making significant improvements to its security and infrastructure to support the electronic medication administration record and EHR implementations. The organization is also investing in its IT staff so that it can support the new systems. It has made the decision to migrate its core applications to the cloud via an SaaS model. There are many vendors on the health IT market today selling electronic health record systems, including Allscripts, athenahealth, Cerner, Credible Behavioral Health, eClinicalWorks, Epic, Greenway Health, HCS, Meditech, Netsmart and NextGen Healthcare. To successfully implement and launch an electronic medication administration record and an EHR, Jabour spells out a step-by-step plan. Develop a request for proposal. Find templates on the Internet. Know “needs” versus “wants.” Provide overview of the organization. Specify what one wants to know about the vendor. Specify how one wants the response to look. Conduct vendor discovery sessions. Develop a vendor scorecard. At Keystone, more than 30 employees reviewed three systems, visited others using the software, and scored each finalist on many different criteria. Weight was given to numerical scores but also comments. Narrow list to three vendors and conduct onsite presentations. Narrow list to two vendors and negotiate terms and conditions and price. Meet potential project team members and discuss potential project plan. Steering committee and project team meet to discuss pros and cons and select vendor/package. Execute agreement. Kickoff project. The EHR has not yet been fully installed. However, Jabour said that Keystone staff already has had “great discussions” between departments about issues that really will set the direction for the support models for many years to come. “Just going through this process has caused us to reexamine everything we do, from support to billing,” he said. Post-implementation, the individuals staff supports will be better served by staff and leadership that have a complete picture of their needs, goals, support requirements, medical requirements and family requirements, he added. Allow for time after the demonstrations for breakout groups to deep-dive into specific functionality, he added. Contact at least three references and do at least one site visit, he advised. Negotiate the terms and conditions, service levels, and pricing before staff become enamored with one package, he said.